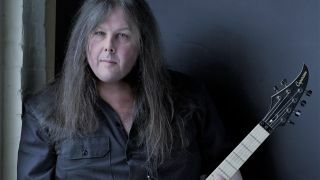 Symphony X guitarist Michael Romeo has revealed that he’ll release a solo album this summer. The record is titled War Of The Worlds Pt. 1 and it’ll launch on July 27 via Music Theories Recordings/Mascot Label Group. War Of The Worlds Pt. 1 is said to pay homage to “film score giants Bernard Hermann and John Williams” and will also features EDM/dubstep elements. Romeo explains: “It’s me putting all the things I love about music in a blender. Somebody might listen to it and say, ‘What is this guy thinking?’ But it's all about being creative and having a good time with it. Romeo and bassist DeServio went to the same high school, with the guitarist revealing that they had always wanted to record together. The guitarist says that part two of the album is “already finished” and adds: “It just needs a few vocals, a couple of solos and a few tweaks here and there. To mark the album announcement, Romeo has launched a lyric video for Black which can be found below.